The central landscape of Northern California is dominated by Mt. Shasta and Mt. Lassen. Lassen Peak rises 2,000 ft above the surrounding terrain and has a volume of 0.5 cu mi, making it one of the largest lava domes on Earth. It was created on the destroyed northeastern flank of now gone Mount Tehama, a stratovolcano that was at least 1,000 ft higher than Lassen Peak. This painting was from a trip to Vegas in late February, 2014, and shows the northern face of Mount Lassen from Old Station. One of my favorite things about living in Mt. Shasta is that I get to see my favorite haunts at different times of the year, and this is the first time I've seen Mt. Lassen covered in snow. 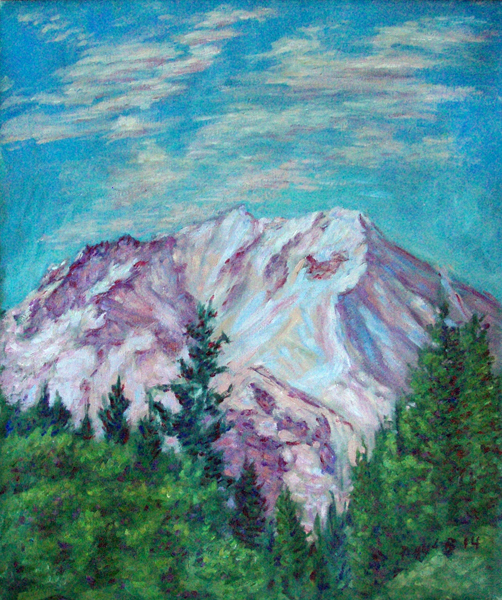 Notice the different whites, the bluish whites at the top becoming warmer and darker as it winds from top to bottom, surrounded by the evergreens at the base, accented with strong blues and violets. PaulB's Pointillistic/Impressionist original oil paintings of National Parks and various prints and poster formats of a wide variety of subject matter by the Pointillistic/Impressionist oil painter from landscape/waterscape paintings, dance, sports, portrait, to classical figures, flowers, rock and roll, Brazil, and National Parks paintings and prints are available for purchase for as little as $24.95 for an 8" x 10" matted print on photo pape. Pointillistic/Impressionist Giclee prints of National Parks on real canvas or heavy watercolor paper are available. One of a kind National Parks embellished prints, which are Giclee prints retouched in genuine oil paint by PaulB. Unless noted PaulB's original Pointillistic/Impressionist oil paintiings are oil on canvas. Paul Berenson's pointillistic/Impressionist oil paintings are in privale collections around the world, including the downtown Los Angeles Athletic Club and have appeared in numerous publications, including the New York Philharmonic Playbill. PaulB.com also builds websites and PaulB is a member of the LA Web Professionals Group.